macaroni & cheese: My MPB Sew-Along Muslin, finished! My MPB Sew-Along Muslin, finished! Finally finished! WOOT! From Simplicity 5047, c. 1972, with the addition of the Kwik Sew 3422 collar with separate stand. The collar on the Simplicity was a bit too large for a modern shirt. Double-buttoned cuffs, one rounded pocket. The collar stand from the KS pattern was slightly longer than what I needed for this shirt, so I had to reshape and take off about 3/4" off of each end, but I left the collar part the same. It fit perfectly. The thing I learned on this shirt (and I learned a lot of things!) that I like the most was Peter's Pocket Trick. What you do is trace the pattern pocket without the seam allowances onto cardstock, then press your fabric pocket around it! Then, it's perfectly shaped, and so neat! I used this trick on the pit crew shirt I made for William, and then just stored the template in the pattern envelope. I already knew how to do flat-felled seams, but I had never done them on the side seams. See the seams? I'm so happy with these! The yoke, the collar. That collar turned out great. For some reason I was fearful of collars with a separate stand, but once I looked at the instructions, I was amazed at how easy it was. Now, I feel silly for being fearful. It was SO easy! Lots of bang for the buck, with those. The inside of the shirt. Here's Doug in the shirt before buttons and hem. Look at the collar fit! The back. There is something wrong with the fit around the sleeves. Hopefully, I can figure it out before I make the "real" one. Look at all that extra fabric on the sleeves. Weird. AND these sleeves were much more narrow than the pattern I had used previously. Looking at my instructions. With these boys around it's like sewing in a war zone. This is Aldous' handywork. and the shirt, with buttons. Pretty buttons! These are my fav buttons, and I used the last of them on here. The same buttons are on William's Lutterloh shirt I made, the red one. And, the back of the shirt. Ahh, I'm glad to be finished with this. Thanks for looking, and for your comments! I can't wait to start on the next one. 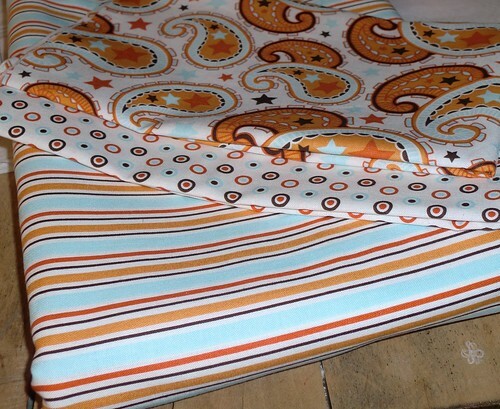 I'm using this fabric, remember this? I'm the one that pestered you with construction comments on flickr, just so you know. I find it interesting that you sort of combined the 1970s shirt with the Kwik Sew. Everything on your shirt looks so good! I can't wait to see the final version. I don't mind your questions! I'm pretty pleased with how it turned out, despite the finagling I had to do to get the collar stand drafted to the right size. I, also, can't wait to see how the final one turns out.